McFadyen Group - McFadyen Group is a leading provider of affordable excavator hire on the Sunshine Coast, Queensland & around Australia. Contact us to find out more. Excavators are essential Plant for many construction projects; ensuring large-scale tasks are completed easily and efficiently. 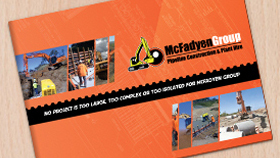 McFadyen Group (MFG) is an industry-leader in excavator hire on the Sunshine Coast, and across Australia. MFG has the best solution when it comes to hiring excavators because their modern and reliable equipment is of the highest quality and consists of brand names such as like Caterpillar, JCB, Doosan and Airman. MFG provides excavators for any size projects, such as a small division up to a major highway upgrade. With a strong and trustworthy reputation, MFG is a leader in the industry. MFG provide high-quality Plant and Equipment, which is regularly serviced by their highly experienced and qualified fitters. These same fitters are available to service and maintain MFG’s Plant Hire fleet at any point anywhere, including a Client who may also require such assistance under a Dry Hire agreement. Additionally, all key staff members at MFG have extensive industry experience at Pipeline Construction projects of various scales throughout Australia. This gives them a strong knowledge base to successfully complete any project and to assist Clients in any way possible. MFG offers a wide range of Plant, including small, medium, and large sized excavators. MFG also provide a wide variety of Plant for Combo Hire. With its wide range of quality Plant and Equipment, MFG has been contracted to help deliver some of Australia’s largest projects. This includes various Pacific Highway Upgrades, Richlands - Springfield Rail Extension, Ballina Bypass and South-West Transit Corridor. MFG have grown to become one of the most trusted contracting companies in the Plant Hire and Pipeline Construction industries, with regular Clients including government departments, local authorities, and some of Australia’s largest contractors. MFG’s expert staff members are always on hand to assist a Client solve any problem whenever necessary. If you require more information about excavators for hire, please don’t hesitate to contact MFG. MFG is more than happy to answer any questions or to provide a quote.